Hello Nosh Show listeners! You all listen to our podcast right? It's me, Eric the Junk Food Guy, GrubGrade Ryan, and our fearless leader Marvo of The Impulsive Buy. It's a great big ball of fast food and junk food banter. Fall is officially upon us so we delve deep in to the mysteries of fall flavors (and the onslaught of pumpkin everything). Despite having been to several grocery stores before recording Episode 39, I did not have a package of Pumpkin Spice Oreos to try along side everyone else during the show, and that's a shame, because they are really good. Like, I can't eat just one or two good. It may not be something you rush to grab, but as soon as you have one, you need MORE MORE MOAR! Yes, they are that good. They are just full of this flavorful creme that goes perfectly with the golden Oreo. I am very impressed. 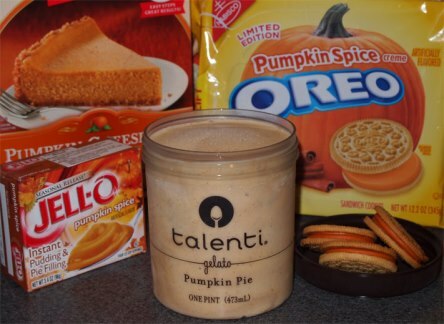 Oh, and that new Pumpkin Pie Talenti Gelato that Nick reviewed? Yeah, that's awesome too. I can't wait to head back to the store and buy 3 or 4 more pints.